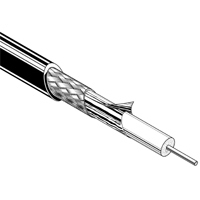 Canares 75-ohm Precision Digital RG6 Coaxial Video Cable is 100% sweep tested. Offering the professional broadcaster (or anyone for that matter) a high performance, low cost, low loss digital coax that meets the demands of todays facility migration trend toward Serial Digital Video and HDTV standards. Special Foam Polyethylene dielectric for extremely low loss. Conductor DC Resistance: <: 7.0 ohms/1000 ft.
Shield DC Resistance: <: 2.1 ohms/1000 ft.